“Now we can cook on all four burners … as well as bake in an oven … and even broil!” that’s what you could hear being exclaimed if you were in Gilford Village at the historical society’s Grange Museum Building this past week. 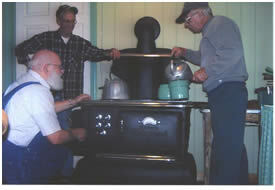 At long last, Gilford’s Thompson-Ames Historical Society has a working stove in the Grange Kitchen! And it’s not just any stove -- it’s an “antique” in every sense of the word, a Glenwood Oak stove 179, No. 590E, made by the Weir Stove Company in Taunton, Massachusetts, USA, in 1912. But the members of Gilford’s historical society won’t have to go through such a long, drawn-out procedure when they use their newly acquired stove. You see, this vintage stove has been modernized, to be more accurate, “retrofitted” as an electric stove. The stove’s top surface has been modernized with four electric burners, the controls for which are housed behind the front left-hand door that used to provide access to the crank for shaking down the ashes. That is the location also for the controls for the oven and broiler as well as for the oven’s electric light. Having a bona fide working stove means that the historical society can now teach how to follow an old time recipe, such as those found in Edna Smith Berquist’s The High Maples Farm Cookbook, and actually be able to do the cooking. That brings to mind the time, a few years back, when Stan Piper offered a Saturday-morning special activity called “Making Bread the Old Fashioned Way”. -- Now, mind you, we didn’t have a working stove in any of the museum buildings at the time. -- Stan took one of the old bread-making pails home and used it as he followed the recipe step by step. He baked a couple loaves of bread, again at home, in order to provide sampling for everyone. Also at home, he formed the dough into small loaf shapes so that everyone could take one home and actually bake it in his/her own oven at home. But during the Saturday-morning activity the adults and children present measured and added the ingredients to the Society’s vintage bread maker and then took turns cranking to blend the ingredients. The participants also acted out the shaping of the dough to form loaves, flouring each, and then timing the rising phases. But the proof of the success of the activity was when the home-baked loaves were brought out and sliced for each person to enjoy. Um-m-m! Looking back in time, it was in the year 1996 when Gilford’s Thompson-Ames Historical Society embarked on its now ten-year old venture to revitalize its historic buildings as museums with the vintage holdings organized into appropriate theme areas. Being able to have this beautiful, electrified 1912-vintage Glenwood Oak stove opens more possibilities to Gilford’s historical society as it preserves and celebrates local cultural history. Members of the public are invited to stop in at the Grange Museum Building, at 8 Belknap Mountain Road, in historic Gilford Village, to come see for yourself what the excitement is all about. This Saturday, September 16th, from 9:00 a.m. until 3:00 p.m., during T-AHS’s 1st Annual Heritage Festival Day, would be a perfect time to drop by to see the stove as well as the many other special events that are on the docket.